Finding a tick lodged in your epidermis happily feeding on your life’s blood can be a scary moment. Just the fact that an insect is drinking your blood is bad enough but the little disease factory can endanger your life, so you need to remove it quick. Before you reach for a match to remove a tick, however, you need to consider if this is the smart thing to do, or just an old wives tale. Here is how it works, in theory; take a lit match, let it burn for a moment, blow it out and then quickly touch the hot part to the tick’s backside. The tick, not at all happy to be having its bottom burned, will back out of its feed bag to escape, at which point you can safely pluck it off and dispose of it. Why go to all that effort, as opposed to just plucking the little bug off? The wives tale says that pulling the tick off is no good, because the head will come off and remain lodged in your skin, leaking diseased saliva where you can’t get to it. There is actually some truth to this concern, but unfortunately the “burn the tick” method of removing can do more harm than good. 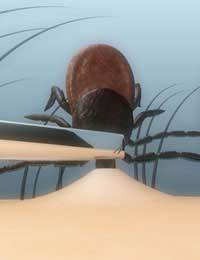 To clarify, you might actually get the tick to back out after burning its bottom; likewise using a hot pin to do the burning or a not- hot pin to tickle the tick’s underbelly may also assist in removing the tick- but along the way it will also encourage it to release more saliva and possibly even vomit directly into your blood stream. Considering that the main reason you want the tick gone is that it likely carries harmful diseases like Rocky Mountain Fever, having it disgorge its dinner into you is not an ideal turn of events. If you don’t want to risk the puking part, another wives tale tells you to smother the tick with oil, sunscreen, petroleum jelly, or any other viscous liquid that is going to cover the tick and clog up it’s airways. The tick, so the story goes, will back out to get a breath. This, as nice as it sounds, is simply not true. The tick has enough air tucked away to continue feeding till it gets its fill; bad news for you, as the longer it is in you, the more chances you are taking with disease. How do you remove a tick safely? Tweezers. Grasp the tick firmly, and pull it straight out. Twisting the tick may not tear off it’s head, but it very well might tear off its mandibles and leave them behind—something you very much want to avoid. If you have no tweezers and need to use your fingers, better that then to leave it in. Just make sure to disinfect your digits—and the wound—when you are done. Prevention is the better part of the cure when it comes to ticks. Use plenty of tick repellent, and reapply it when in a wooded area frequently. Long socks and long pants are a big help as well.